Setting up an evaluation environment is always a big challenge for product evaluations. Therefore, we have removed the setting up challenge by providing downloadable, pre-configured, ready-to-use VMs that you can download and run, as illustrated in Figure 1-1. Download the administrative-ready VMs, then explore both the administrative and the end user exercises. Download the end user-ready VMs, then explore only the end user exercises. Download and install Open Enterprise Server and Filr evaluation software, then explore the administrative and end user exercises. 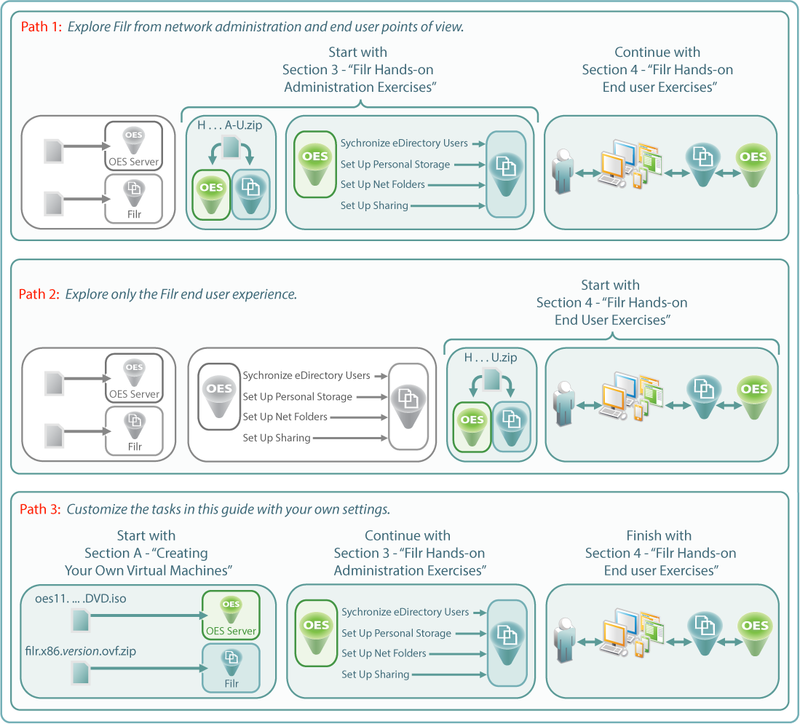 One set that is ready to be used with Section 3.0, Filr Hands-on Administration Exercises, and then with Section 4.0, Filr Hands-on End User Exercises. One that begins where Chapter 3 ends and is ready for Section 4.0, Filr Hands-on End User Exercises. Both sets contain fully functional evaluation installations of Novell Filr and Novell’s premier file server—Open Enterprise Server 11 SP1 (OES 11 SP1). No previous OES experience is required for using the exercises in this guide. To facilitate Filr evaluations, Novell provides the ability to install Small Installation Filr appliance, in which the Filr appliance, database server, and search engine all run in a single VM. Both of the hands-on evaluation file sets include one Small Installation Filr appliance. Small Installation Filr appliances are not suitable for production environments from either scalability or performance perspectives. Production environments require at least three separate single-purposes appliances that are running: the Filr appliance, a MySQL database server, and the Filr-supplied Lucene search appliance. There is no migration or update path for converting a small installation to three separate appliances. Therefore, there is no path for moving the hands-on evaluation VMs to a production environment. As illustrated in Figure 1-1 and explained above, there are three possible paths through this guide. After picking a starting point, be sure to access and complete the remaining instructions in the order given. Each section and sub-section depends on completion of the tasks that precede it. If you want to install additional virtual machines, create a different eDirectory tree structure than the one specified in this guide, or diverge from the instructions presented, you can still use these instructions as a basic outline for getting acquainted with Novell Filr. For more information, see Section A.0, Creating Your Own Virtual Machines for the Filr Hands-on Exercises.